"Vodka martini. Shaken, not stirred." This film quote has made history. Casino and James Bond lovers know it all too well: Whether Pierce Brosnan in "Golden Eye", Timothy Dalton in "License to Kill" or Daniel Craig in "Casino Royale" – all Bond actors prefer to drink their vodka martini shaken rather than stirred. But what’s the deal with the drink? 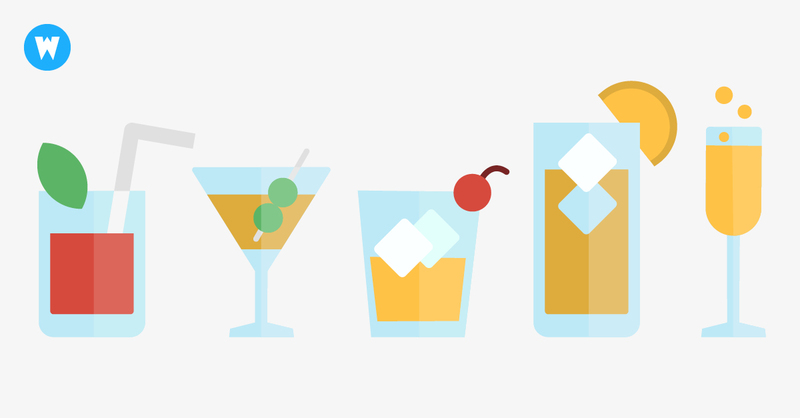 For you, we not only took a look at the Martini, but also at four other popular casino drinks. Because: For every occasion, for every game and for every gambler there is the perfect drink – you just have to find it. We’ll even equip you with recipes – so you can try them at home while you win your next prize at Wunderino. Let’s face it, a Bloody Mary at the casino is always fun, right? This cocktail, originally from Paris, not only captivates with its taste, it is also a real vitamin bomb. Maybe that’s why it’s so popular with Blackjack and Craps – after all, you will need "nerve food" here. By the way: The Bloody Mary was the favourite cocktail of actress and fashion icon Marilyn Monroe. For us one more reason to try the blood-red drink. Remember: Bloody Mary tastes excellent even without alcohol. Preparation: Mix celery, salt, pepper, Worcestershiresauce, vodka, Tabasco sauce, ice cubes and tomato juice in a glass. Garnish with lemon. 2. The Bond classic: Vodka Martini – shaken, not stirred. The Martini à la James Bond appears for the first time in the 1967 "Casino Royale" version. From there it found its way into many films of the series. Fun Fact: The real name of the James Bond Martini is "Vesper Martini". “Vesper" refers – needless to say – to the famous Bond girl Vesper Lynd. Preparation: In the original recipe Gordons Gin, Vodka and Kina Lillith Vermouth are mixed (!) to a cocktail – but the Bond version is slightly modified: Vodka and wermuth are replaced by Smirnoff Red Label and Lillet Blanc or Noilly Prat. Instead of the obligatory olive, Bond enjoys his martini with a spiral of lemon peel. Another classic. The Old Fashioned is not only one of the oldest, it is also one of the most popular cocktails in the casino. In the books on which the later films are based, 007 also occasionally enjoys an Old Fashioned – unfortunately, this detail has been somewhat neglected in film history. Fun Fact: As one of the oldest mixed drinks from the Prohibition era, the Old Fashioned is known both as a "male" cocktail and as "something your grandmother would drink". It’s a perfect match for Bond and his aged boss "M", isn’t it? Preparation: Mix a drop of Angostura bitter, sugar syrup, soda, bourbon and ice cubes. Garnish with lemon peel. An absolute wake-up caller who is one of the favourite drinks of the late-night audience worldwide. This unique combination of awakening Red Bull and intoxicating vodka makes the drink a dangerous choice when gambling in the casino – but it will undoubtedly keep the player awake. Watch out: Vodka Bull is usually one of the expensive drinks on the menu – unless the drink is part of the free drinks provided by the casino. Fun Fact: The basis of today’s Red Bull is an energy drink from Thailand called "Krating Daeng" – if you add the caffeine content of all Red Bull cans sold in 2013 together, you get an incredible 475 tons. Preparation: Should be clear. Only the mixing ratio is of course up to you. Casinos are notoriously not the simplest of facilities. On the contrary, the display of pomp and glamour and boundless decadence are the order of the day in many larger casinos. Why not just get involved? The sparkling wine from Champagne has always been associated with success – so after a big win, a glass is often served to toast. A word of warning: Bottle shaking isn’t willingly accepted by other gamblers and the infamous casino managers – luckily Wunderino doesn’t have such a thing. You want to drink a glass of champagne to your success? Become a winner at Wunderino Online Casino! Don’t limit yourself to blackjack and roulette, but get regular free spins and bonuses in poker, slots, live casino or captivating table games. And on the go? Our Wunderino App lets you take your mobile casino with you wherever you go. Not only the matching drinks but also a matching outfit are popular in casinos. Read here, which dress code applies in the casino and with which wardrobe you make the right choice.